You are here: Home » BBQ Season Begins! Gotta make this quick, as I’m off to the first official BBQ of the season! It is a glorious 23 degrees Celsius out today. Better enjoy it now – it’s supposed to rain all weekend! It really needs to start getting busier at work, because I’m am boooored. Actually, I get to about 2:30 pm, and run out of things to do. Hopefully the better weather will mean more vessels are fishing. Mores vessels fishing = more work for me! Lunch was another Amy’s taste-testing adventure. I decided on the Vegetable Barley soup. 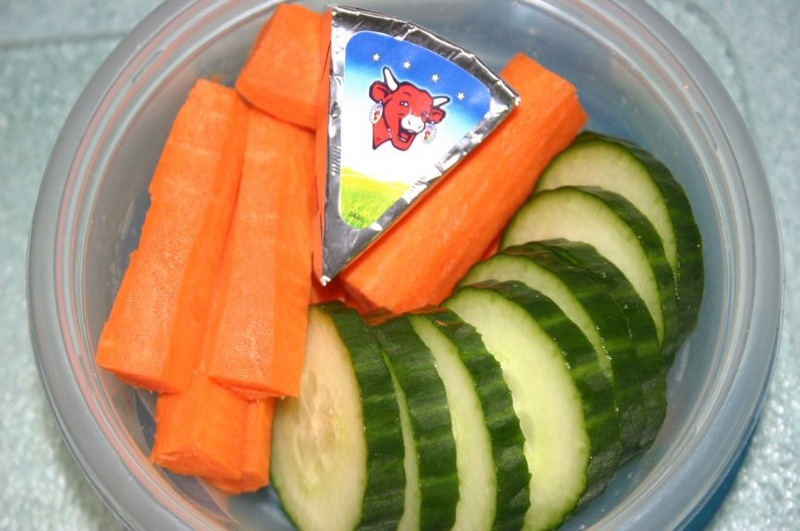 The usual veg – carrot & cucumber. As you can see, a wedge of Laughing Cow hoped in for the ride. 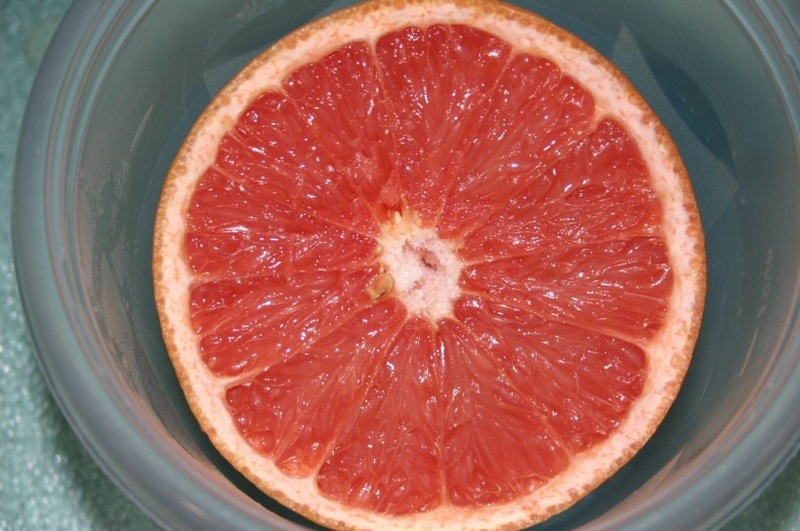 Half of a juicy red grapefruit. 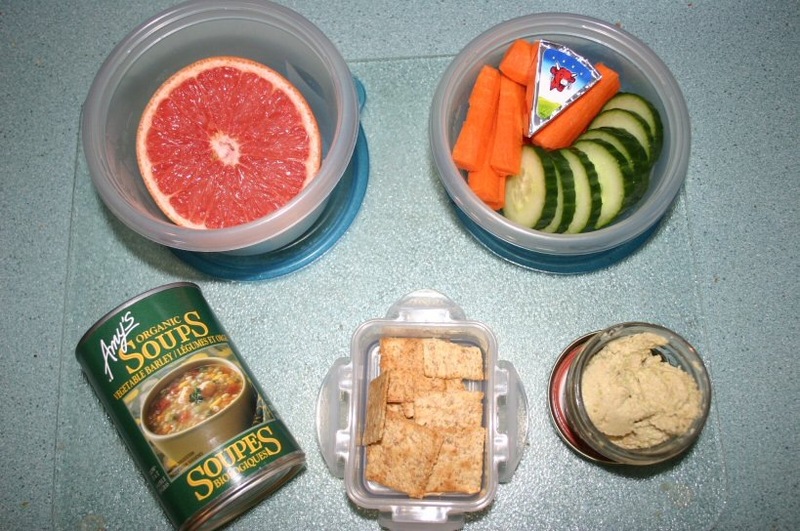 I also grabbed some edamummus for the veggies, and Wheat Thins to go with the Laughing Cow. So, the soup. As soon as I opened the can, it smelled of onions. So I check the ingredient list – yup, onions are the first ingredient (well, besides water). The soup was okay – lots of veggies and barley. But there are too many onions, so they tend to over power the other flavours, and leave you with onion breath afterwards. Don’t get me wrong, I like me some onions, but this soup doesn’t quite have the right balance of onion flavour with the rest of the ingredients. Are all Amy’s soups onion heavy? I also take issue with the can saying there are 2 servings. If they call 1 serving 1 cup (250 mL), then the can has less than 2 servings. I ate the whole thing, because really, it’s not that much soup. El Presidente at work brought around chocolates this afternoon, so I snagged a white chocolate truffle. It was pretty much amazing, and perfect for a Friday afternoon. 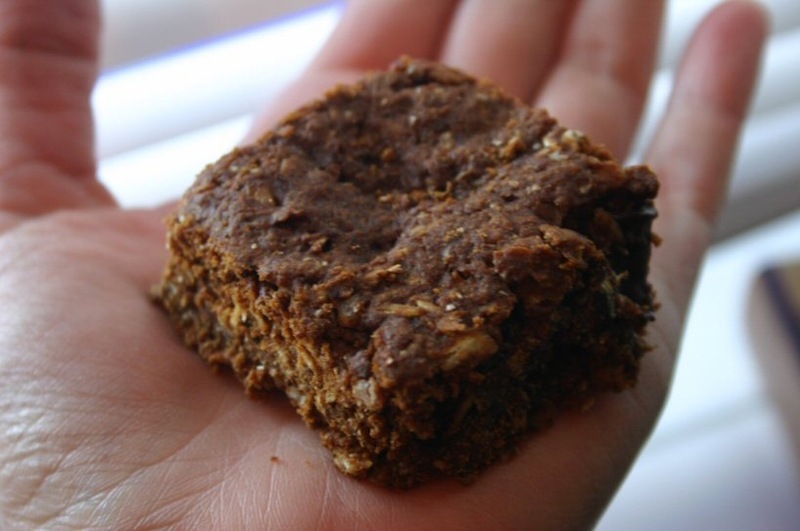 That photo make the bar look gargantuan! But I swear, it’s not really. I also selected a bottle of wine to take to the BBQ. I was told I didn’t need to bring anything, but I always feel the need to. Obviously, there was no time to whip anything up after work, so to the wine cupboard it was! This is actually a U-Brew wine that a group of us at work bottled last June. I got a half share – 15 bottles of three kinds. And I think I still have, what, 12 of them? I obviously don’t drink alot. I like tasting and buying wine, but rarely drink it. Is that weird? 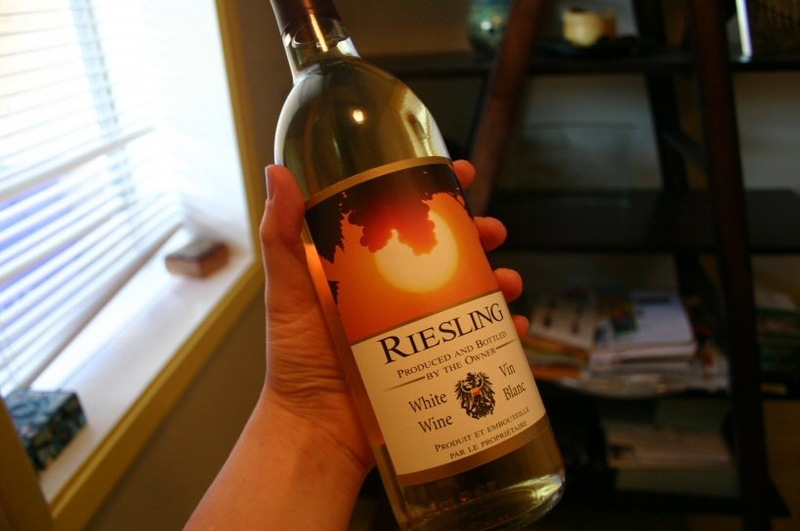 wine wine wine..i totally bought some today and totally plan on devouring it this weekend! I feel the same way about the serving sizes of Amy’s soup cans. Make them 500ml, then! I always eat the whole can, too. I haven’t tried that particular kind, so I can’t comment on the onion, though I consider myself warned!! Hope the BBQ went well!!! Have fun!!! That bottling your own wine thing sounds fun!!! OMG honey. Drink the wine. Mmmmmmm grapefruit. I need to get my hands on some! Too many onions?! Blasphemy! I bought that can of soup a few weeks ago but SOMEONE in my house ate it. 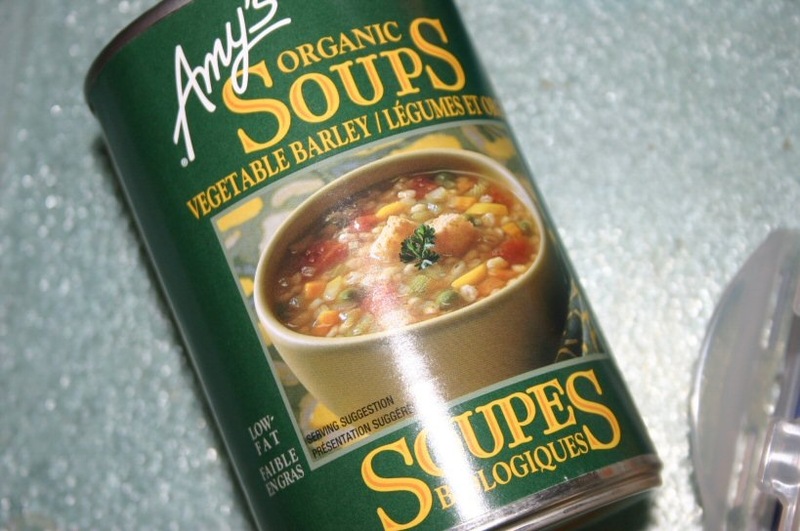 i always end up eating the whole can on amy’s soups. def not 2 servings! hope the bbq was fun!